The meeting was hosted by Sarah Miller, CEO of the Rediscovery Centre and Project Manager for WISER LIFE, who also gave the keynote address. 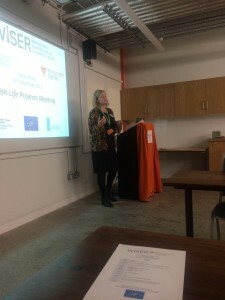 In that address, Sarah gave an account of the genesis of the WISER Project, the construction of the ‘3D Textbook’ in the old Ballymun boiler house, the project’s progress throughout 2017, and plans to expand Rediscovery Centre enterprises under WISER LIFE in 2018. The project partners then gave a series of fascinating accounts of their projects and their work. Jack McGauley of The Living Bog project outlined his team’s efforts to protect over 2,600 hectares of threatened raised bog habitat in Galway, Offaly, Longford, Roscommon, Cavan and Westmeath – fully 18% of Ireland’s high bog area. 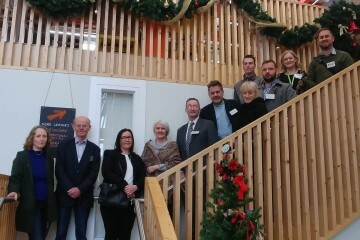 Next, Carol Gleeson of GeoparkLIFE discussed her project’s attempts to establish a ‘tourism for conservation’ programme in the Burren and around the Cliffs of Moher – among other things training more than 100 tourist-facing businesses in sustainable practices. Then Nuala O’Riordan of IRD Duhallow gave an account of two parallel projects – LIFE SAMOK and Raptor LIFE – that aim, respectively, to conserve and restore the Munster Blackwater River as a habitat for aquatic and amphibious inland animals, and to protect specific species of avian and aquatic life in the area: Atlantic salmon, Brook lamprey, the hen harrier and the merlin (Falco columbarius). Richard O’Callaghan of KerryLIFE then discussed his team’s conservation efforts in the Caragh and Blackwater river catchments of Kerry, aimed particularly at conserving the freshwater pearl mussel. Finally, Patrick McGurn of AranLIFE spoke about his project’s ambitious effort to align farming practices on the Aran Islands with the islands’ status as a special conservation area for European flora and fauna. 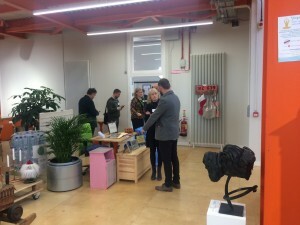 communities and existing social infrastructure. The meeting of all these project teams in one place reinforces the idea of community on which the projects and indeed the natural environment depends, and we hope to host many more events like this.